Have you ever wondered what it would be like to sit in the pilot’s seat and fly a plane? From exploring the skies to flying to remote vacation spots, piloting a plane is a dream for many. If flying a plane is a dream of yours, you can fulfill it – and the first step is to get your pilot’s license. Here’s all you need to know to get started. Don’t want to spend a lot of time or money to become a pilot? You’ll want to get a sport pilot license (SPL). Obtaining a sport pilot license is significantly easier than obtaining other types of pilots’ licenses: there are fewer requirements, meaning you don’t have to spend as much time in the air. Learning to fly at night isn’t a requirement of the SPL, and no medical exam is needed as long as you have a valid driver’s license. However, pilots with SPL licenses are restricted to flying two-seat, light sport aircraft only. As a recreational pilot, you can fly bigger aircraft than you can with a sport pilot license — but it’s only a certificate, not an additional license. You can either earn this certificate alone or on top of your SPL. There are fewer requirements to earn a recreational pilot certificate than an SPL. You will have a few restrictions, though; you can only carry one passenger in a single-engine aircraft, and you won’t be able to fly more than 50 nautical miles from your home airport, eliminating the possibility of cross-country flights. The private pilot license (PPL) is the best choice for anyone who wants to pursue a career in aviation or fly long distances. With a private pilot license, you can fly just about anywhere within the United States. You also can fly outside the U.S. as long as you meet the requirements of any foreign country you’re visiting. There’s no limit to the number of passengers you can carry, and you can fly as high as 18,000 feet. The primary difference between a commercial pilot (CPL) license and all other types of pilots’ licenses is that a CPL allows a pilot to fly for financial gain. Obtaining a CPL is the first step in becoming a career pilot – with a CPL, you can work for major airlines or even fly others as part of your own business. To qualify for a CPL license, 43 Flight School¹ reports, a pilot must have 200 total hours of flight time with 100 of those as the command pilot. You’ll also need to attend a certified commercial pilot training school before you can fly commercially. With so many different options available, it can be tricky to determine which license actually fits what you want to accomplish as a pilot. Do you want to fly solo and keep things simple with a sport pilot license? Or do you one day hope to pilot a commercial plane and turn your dream into a career? First, consider your goals. Assess how often you think you’ll put your license to use – how often will you fly? Will you be flying just yourself, or will you want to transport others at times? If you plan on flying friends or family, a private pilot license is best. If you just want to take to the air as a hobby, a sport pilot license is the easiest and simplest option. One of the main advantages to obtaining a sport pilot license is only 20 hours of flight time are required. A private pilot license requires 40 hours on in-air training. Next, consider how much flexibility you want to have as a pilot. An SPL license means only you and one other person can fly together at a time. A private pilot license provides more flexibility; for example, you could fly business associates to a meeting one day and fly them back home the next. Or, you could fly to a vacation spot located just about anywhere in the world. And don’t forget to factor in your expenses, both financial and otherwise. While a commercial pilot license also affords you these flexible perks, it also takes longer to earn and costs more money to train for. SPL and PPL licenses require less flight time, meaning you’ll spend less time and money in the process. Most people assume earning a pilot’s license is incredibly expensive. While the process isn’t surprisingly cheap, it is quite affordable. You don’t need hundreds of thousands of dollars and a plane of your own to get your license and pilot a plane – you can learn and become certified for as little as a couple thousand dollars. The cost depends on which license you’d like to earn. Because the holder of a sport pilot license is restricted to a two-seat plane, it’s less expensive. You’ll only need to rent a two-seat plane in order to learn how to fly, which is less expensive than renting a standard four-seat plane. And you can expect to spend as few as 20 hours in the air with an instructor, which comes with a fee. 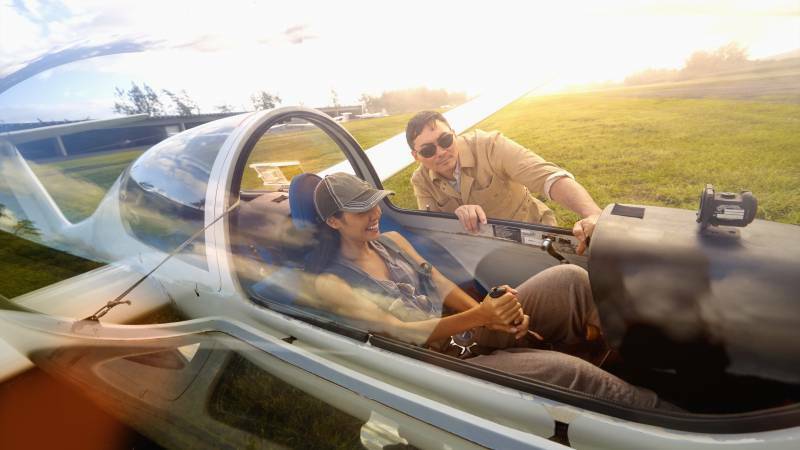 A private pilot license lets you pilot a bigger plane, which will cost more to rent, and you’ll also need between 40 and 70 hours of training that you’ll need to pay for. The Aircraft Owners and Pilots Association² estimates that earning your license comes with the following price tags: an SPL costs approximately $3,000, a PPL costs about $7,000, and a CPL comes with an average cost of $20,000. If you’d like to earn additional certificates or ratings, like a multi-engine or instrument certificate, you’ll pay just $3,000 to gain new skills such as flying during cloudy weather conditions or flying higher and faster. If you’d like to obtain your pilot’s license, you owe it to yourself to do your own research to determine the best type of license for you. Make sure to research what each license will cost you in plane rental, instruction, and any licensing or certification fees. Getting your pilot’s license is easy, but it’s up to you to choose how you’d like to fly. When you’ve made up your mind, you can begin the process by looking for the best flight schools or instructors in your area. Sometimes, with careful research, you can save money on the process with local offers through sites like LivingSocial or Groupon, or get the chance to rent a plane at a discount if you purchase a block of lessons. Search for offers like these, and getting your pilot’s license can be both easy and affordable. Interested in getting your pilot’s license? Start a search today.